There are some men who are certainly willing to invest in the highest quality electric razor to ensure that they get the best shave possible every single morning. If your only experience with electric razors is one that you had for years, then now may be the time for you to take a look at the Panasonic ES8109S. This three blade, wet/dry rechargeable razor provides some of the latest in shaving technology while also providing you with a close, clean shave every single time. This 3 blade electric shaver uses nano tech rechargeable technology and a vortex cleaning system to help extend the life of the razor and to give you the best shave possible. This has a linear motor that can achieve 13,000 revolutions per minute, which helps to eliminate pulling and tugging on even the heaviest beards. For men who suffer from a lot of skin irritation when shaving on a daily basis, the Panasonic ES8109S can help to prevent much of that and give them is smoother shave with no nicks or cuts. One of the reasons why this can provide you with such a close shave is because it has three arc blades made from hypoallergenic, stainless steel and a pivoting head that goes back and forth and up and down so that getting around any facial contour will be easy. What Features Does the Panasonic ES8109S Have? The Panasonic ES8109S has a unique cleaning system that uses a water-infused hygienic solution to help get rid of debris, stubble, and skin from inside the shape. This helps to keep the razor clean and lubricated, while also giving you the best shave every day. By using this cleaning mode, you can increase the motor speed up to 13,000 revolutions per minute so that all of the debris comes out easily. A universal dual voltage charging system, a rechargeable lithium-ion battery, and a travel pouch. The charging time is approximately 1 hour and you should expect to get approximately 45 minutes shaving of each charge, which makes this the ideal razor for even longer trips away from home. 30 degree flexible head to maneuver on the contour of your face for a close shave. What Do Real Men Say About the Panasonic ES8109S? When you begin to read the reviews for the Panasonic ES8109S, you will see that there is little doubt that men who are looking for quality will choose this model. This has a very good reputation for being easy to work with, easy to clean, and for having a very long battery life. Although you might see commercials on television where men will say that they got a shave with their electric shaver that was as close as a regular razor, we all know that is rarely possible. But, with the Panasonic ES8109S electric razor reviews seem to show that this model really does help men to achieve that goal. Where Can You Get the Best Deal on the Panasonic ES8109S? When you get this kind of technology, you should expect to pay a little extra, and so the best deal on the Panasonic ES8109S right now is online. This is actually a pretty hard shaver to find in any department store, but it is available online as our additional blades and other accessories. Of course, not every man is going to want to spend this kind of money on a razor, but based on the reviews that you will read online, it seems well worth the price. Not only will this help to give you the best shave possible, but because of the way this uses a unique cleaning method, you can expect this shaver to last you many years. The Panasonic ES8109S is a far cry from shavers that were made even a few years ago, and has been a worthwhile investment for men all around the world. 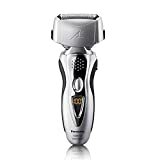 Click Here to check out this shaver on amazon.com.